My last post was on what I said about improving a law firm at Reinvent Law London 2014. This post is on what others said on Twitter about my talk. Interest seemed to be piqued most on pop-up law and having fun. Two of the more novel concepts for lawyers perhaps! Omg! 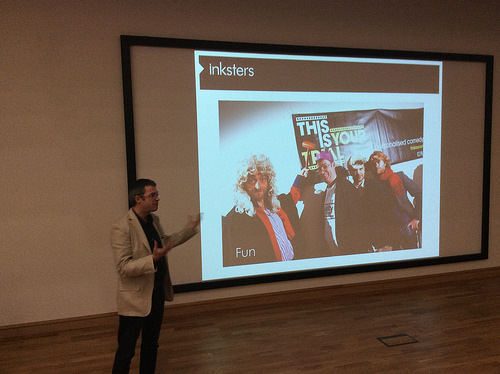 @BrianInkster just used photo of me wearing @inksters Christmas hat at @ICEHOTEL_Sweden as one of his slides at #reinventlaw ! At #reinventlaw @BrianInkster saying we should have some fun. Lawyers can be a bit boring. Really? Seminal talk from @BrianInkster on how to implement #reinventlaw. Small steps, well thought thru, delivered well. Simples. @BrianInkster 🙂 it is actually worth another look. Also a really good #ignite talk: succinct, entertaining and got the message across. Ivan @LegalTrek on 18/07/2014 at 11:46 am. Brian, this was my most favorite talk at #ReinventLaw London 2014. You have clearly demonstrated that it is still very possible to maintain a highly competitive law firm, even when all others use the “market is over-saturated” mantra as an excuse for doing nothing. I applaud you for your vision & execution.